The use of 3D geo-information has rapidly developed in recent years. Technological advances have driven this evolution and reduced the costs involved in the procurement and processing of 3D geo-information. Consequently, National Mapping Agencies (NMA’s) are actively seeking to transform their data operations and processes to produce such enhanced products. However, budgetary constraints in the public sector necessitate a rigorous assessment of costs and benefits before opportunities can be developed. 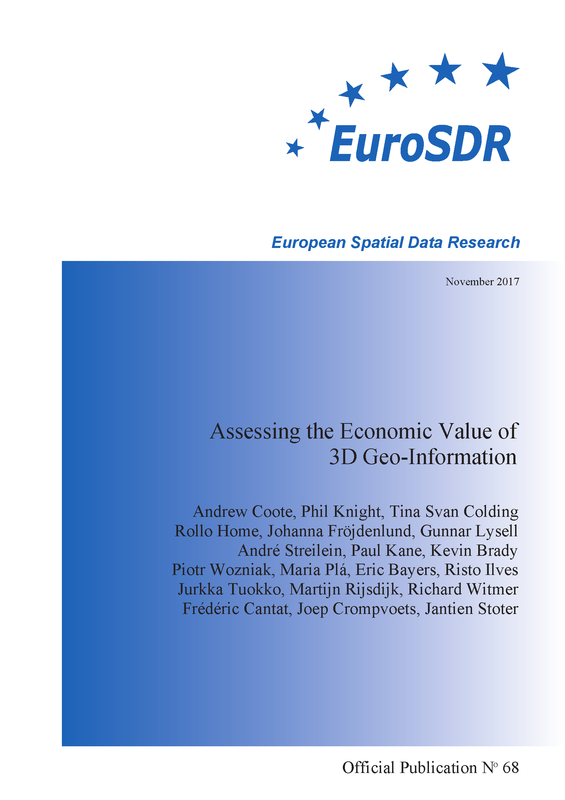 This report is the culmination of a EuroSDR project that undertook a business case analysis over 12 months in collaboration with 11 European national and regional mapping agencies. The analysis undertaken was structured around use cases (in order to examine the value derived within specific business contexts) and employed two methodologies: (i) value chain analysis and (ii) cost-benefit analysis to identify the quantification of value add identified by value chain analysis and the assessment of costs. Value chain analysis identifies the connections between the supply and demand sides of a product or service and qualitatively identifies the value that is added throughout the chain of processes from source to end-user. Cost-benefit analysis facilitates an estimation of Return on Investment (RoI) by quantifying the costs and quantifiable benefits that arise from an investment over a defined period of time. The project’s stakeholders initially selected six use cases for study: forestry management, flood management, 3D cadastre and valuation, resilience (civil contingency), asset management and urban planning. Over the course of six different workshops value chain analysis was applied to each of these use cases. Out of this process, two use cases were then selected for quantification using cost-benefit analysis: flood management due to the ubiquity of the challenge and its high political profile, and urban planning as 3D geo-information has a significant potential to contribute to the problems of managing urban growth. The process ended with the findings and outcomes being shared and consolidated at a workshop attended by delegates from each stakeholder. • General improvements to public sector efficiency Based on a 10 year project life cycle and discount rate of 4%, the results indicate a benefit to cost ratio of 2.1:1 and Net Present Value of € 22 million. Cost Avoidance (Option 1) - this estimates the damages and losses that could have been avoided had 3D geo-information been used rather than the information used currently. The avoided damages are then interpreted as the benefits of using 3D geo-information. It has the advantage of requiring only limited inputs and is based on data available from Switzerland: (i) historical information on the loss and damage from previous events and (ii) interviews 8 with experts to indicate the positive effects of a high accuracy DTM. This resulted in a benefit to cost ratio of 3.3:1 and Net Present Value (after 10 years) of € 8.9 million. Case Study (Option 2) - this uses case study evidence from the Netherlands on public sector benefits from data sharing and the reduced costs of: (i) land survey work, (ii) failures resulting from earlier detection of design errors and (iii) environmental impact assessments. This assessment gives a benefit to cost ratio of 3.2:1 and Net Present Value (after 10 years) of € 8.6 million. Benefits Transfer (Option 3) - this uses information from a comparable study undertaken for USGS study entitled, ‘National Enhanced Elevation Assessment’ [Dewberry 2012]. Belgium has been used to illustrate this approach, although results for other countries involved in the study can also be automatically calculated within the financial model. This assessment method gives a benefit to cost ratio of 5.3:1 and Net Present Value (after 10 years) of € 27 million. The higher return calculated by this approach can be explained as Belgium would be unlikely to achieve the economies of scale of data capture costs in the US. A benefit to cost ratio “write down” of 50% would bring it into line with the returns predicted by the other two approaches. The cost-benefit analysis demonstrated in both of the selected use cases that benefits outstrip costs by a multiple of between two and three times even when considering each use cases in isolation. As further applications of 3D geo–information are added, additional costs should rise more slowly, whilst benefits should accrue at a similar rate, thereby enhancing the overall rate of return. Investment proposals with the type of return profile found in this study would be expected to be positively received, provided the funds were available from public sources. 3D Cadastre and Valuation – in the consultant’s view this represents the best opportunity to complete cost-benefit analysis for one of the remaining use cases for which value chain mapping was undertaken. The timing of ground-breaking work in Denmark may mean that access to their internal economic assessment might now be publicly released making this a relatively quick and easy extension of the study into a potentially very financially attractive application. Asset management – this should be approached by the creation of value chains for significant subsets of this large and complex use case, particularly transport asset management and streetworks. The recent study in Queensland may provide an opportunity for a cost-effective benefits transfer process to be applied..